A large group at a dance with two youths in the foreground 'duelling' with spears locked together in mock combat, one with a half-shaved head. This sort of war play was a common feature of such dance gatherings where initiated youths of differing villages faced each other in mock running battles as a show of group prowess. Dances were also significant occasions for courtship. Note on print reverse ms pencil - "02 W.Jikany" & print front border ms ink - "NUER XVI/66"
Morton, Chris. 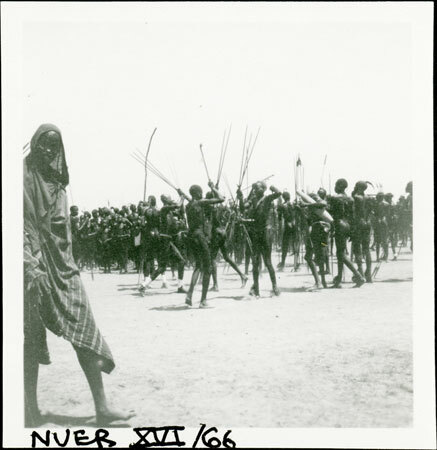 "Nuer mock combat at dance" Southern Sudan Project (in development). 03 Jan. 2006. Pitt Rivers Museum. <http://southernsudan.prm.ox.ac.uk/details/1998.355.785.2/>.